Designs by Lisa Somerville: Happy Fall - Which came first the Chicken or the Egg? Happy Fall - Which came first the Chicken or the Egg? Happy Fall - here's to some cooler weather! 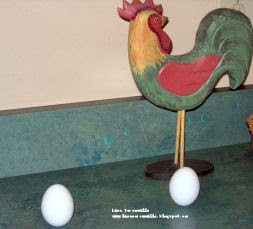 So, how many of you tried to stand your egg upright on the Equinox? Not only did we get one to stand, but we managed to get two! 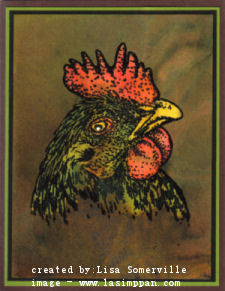 Here's a rooster card I created, that goes along with today's theme....Stamp is from Lasting Impressions with Panache - Hen Profile 177-004K. For this card I morphed the Colorwash Collage Technique from a past issue of the Technique Junkies Newsletter.